Six Clark County teams made it to the Tacoma Dome for elimination day, and two survived to make it to the state quarterfinals. The Skyview Storm rallied from five points down in the final 70 seconds of their Class 4A boys basketball game, and the Camas Papermakers beat Union for the third time this season in their 4A girls playoff. The Union boys joined the Union girls on the wrong end of the scoreboard. The Prairie boys and girls teams both lost close games to see their seasons come to an end as well. For the winners, they advance to the double-elimination format. They must win Thursday, Friday, and Saturday to win a state championship. But one win Thursday or Friday will assure those teams of making it to a trophy game on Saturday. 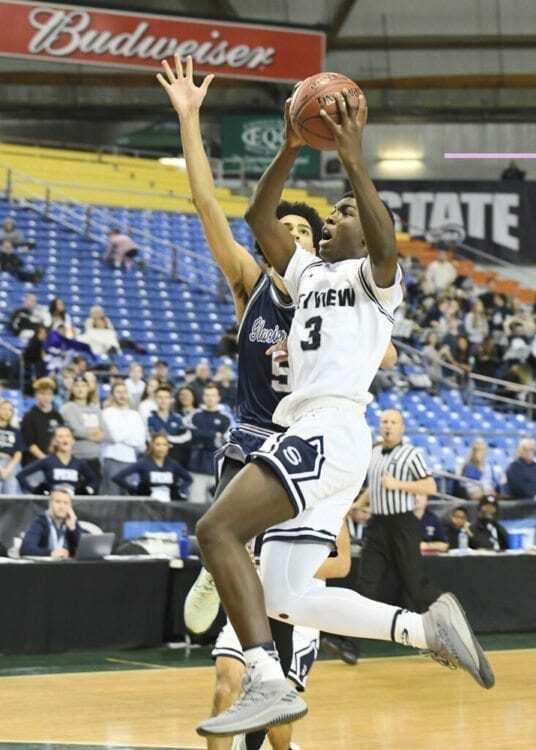 The Skyview Storm had the ball, trailing by one, in the closing seconds of their Class 4A boys basketball state tournament elimination game Wednesday night at the Tacoma Dome. They had one more chance. Correction, they had two more chances. Samaad Hector is on the team, after all. Hector followed up a missed shot by a teammate and scored with less that five seconds on the clock, sending Skyview to the quarterfinals with a 68-67 win over Glacier Peak. The Storm (24-4) will take on Gonzaga Prep (24-0) at 5:30 p.m. Thursday. “Samaad just does a great job of doing his role,” Skyview coach Matt Gruhler said. Glacier Peak missed the front end of a 1-and-1 free throw situation, and Alex Schumacher did his job for the Storm, getting close to the basket to attempt a tough lay-up. Hector’s bucket capped the biggest rally in Skyview boys basketball Tacoma Dome history. OK, so this was the first Skyview boys basketball game in the Tacoma Dome. Still, it was epic. Glacier Peak took a five-point lead with 1:20 to play in the game. Hector responded with a basket, and Skyview called timeout with 1:01 to play. Schumacher scored to make it a one-point game. That set up winning time for the Storm. “Tonight, we made the bigger shots when it counted,” Gruhler said. Hector ended up with a double-double with 18 points and 10 rebounds. Kyle Gruhler made four 3-pointers and scored 16 points. Schumacher added 15 for the Storm. Cole Grossman and Jovon Sewell each had four assists. The coach said the stands were full of support for Skyview’s first appearance in the dome. So he did not have a long post-game speech. Next up is a huge challenge for the Storm, Gonzaga Prep. The Camas Papermakers made it three in a row over the Union Titans this season, and this one was the most important of all. 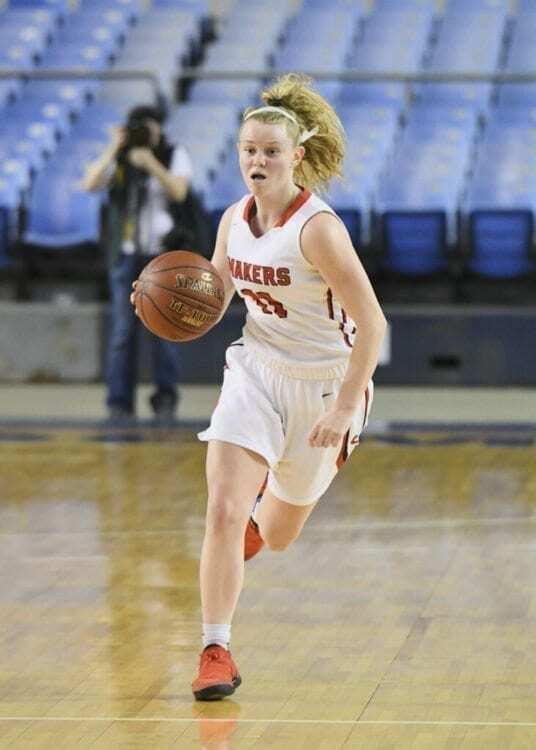 The Papermakers advanced to the state quarterfinals, breaking open a close game with a fine run at the end of the second quarter and then a dominating third quarter, allowing them to cruise down the stretch at the Tacoma Dome. Courtney Clemmer had a double-double with 11 points and 12 rebounds. Haley Hanson added 10 points, and Jillian Webb made three 3-pointers to finish with nine for the Papermakers. Camas (17-8) will take on Eastlake (22-2) at 2 p.m. Thursday in the elite eight. Union’s season came to an end but not until making it to the dome for the first time in program history. The Titans finished 19-8. That’s a school record for most wins in a season, too. Camas made it to the dome for the first time last season. Interestingly enough, the Papermakers beat Eastlake in the round of 12 to advance to the quarterfinals. This year, Eastlake bypassed the round of 12, advancing straight to the quarterfinals, and a familiar opponent is on the way. Camas is used to playing the same teams again and again. The Papermakers are hoping for more than last year, too. They won the Wednesday elimination game in 2017, then lost two in a row and were done on the Friday of state championship week. In Wednesday’s game, Camas got off to a fast start, but Union rallied to pull within a point. Camas, though, had a nice mini-run to end the second quarter to go up by six at the half. It was all Papermakers in the third quarter. Webb hit a 3-pointer and they were on their way, ruling the period 15-6 to take a 15-point lead. Camas had a 40-22 edge in rebounds. The Papermakers had 19 offensive boards. Maggie Wells added eight points and seven rebounds. Marianna Payne blocked three shots. Mackenzie Lewis scored 10 points to lead Union. Rebekah Barney and Abbey Kaip each scored eight points. Union spent much of this season punishing opponents from 3-point land, but the Titans struggled from long range Wednesday and the result was an elimination from the state tournament at the Tacoma Dome. Union made just seven of 24 shots (29.2 percent) from behind the 3-point line en route to the loss to Kamiak. The Titans finished the season with a 20-7 overall record. Union overcame an early deficit to claw its way to a 4-point lead (28-24) at halftime. Kamiak then outscored the Titans 18-4 in the third quarter to post a double-digit lead heading into the final eight minutes. Ethan Smith led Union with 16 points. Smith made five of his 11 shots from the field, including three of nine from 3-point range. Tyler Combs added 13 points to go with five assists and two steals for the Titans. Jason Franklin Jr. had seven points and six rebounds and Zack Reznick added six points for Union. Alishawuan Taylor had a game-high 18 rebounds for the Titans. Prairie led Wilson for three quarters Wednesday, but the Falcons were outscored by nine points (21-12) in the final eight minutes at the Tacoma Dome. Prairie’s stingy defense held Wilson to just 10 points in the first quarter but the Falcons gave up 55 points in the final three quarters, during which they were outscored 55-43. Dante Heitschmidt and Kameron Osborn each scored 16 points to lead Prairie. Heitschmidt made five of his 10 shots from the field including four of his eight attempts from behind the 3-point line. Osborn added six rebounds and six assists for the Falcons. Zeke Dixson and Mathew Kogler each added nine points for the Falcons, who finished the season with a 20-7 overall record. Kogler added seven rebounds and three blocked shots. Logan Reed had six points, seven rebounds and three blocked shots for Prairie. Brooke Walling scored a game-high 27 points but it wasn’t enough as Prairie gave up a first-half lead to lose to Stanwood at the Tacoma Dome. Walling made nine of her 17 shots from the field but the rest of the Falcons combined to make five of 31 shots in the season-ending loss. Walling also had five rebounds and three steals for Prairie. The Falcons led throughout the first half including 24-20 at halftime but Stanwood slowly pulled away in the second half, outscoring Prairie 29-21 in the final two quarters. The Falcons made just five of 25 shots in the second half, including one of nine from behind the 3-point line. Mallory Williams added seven points and five rebounds for the Falcons, who finished the season with a 21-5 overall record.